Meeting for Worship is one of the key specifically-religious activities in the Quaker week. It is based within silence, and may be punctuated with spoken ministry. Ministry may follow a theme, or not, but it is never a discussion. Meeting for Worship ends with everyone shaking hands. 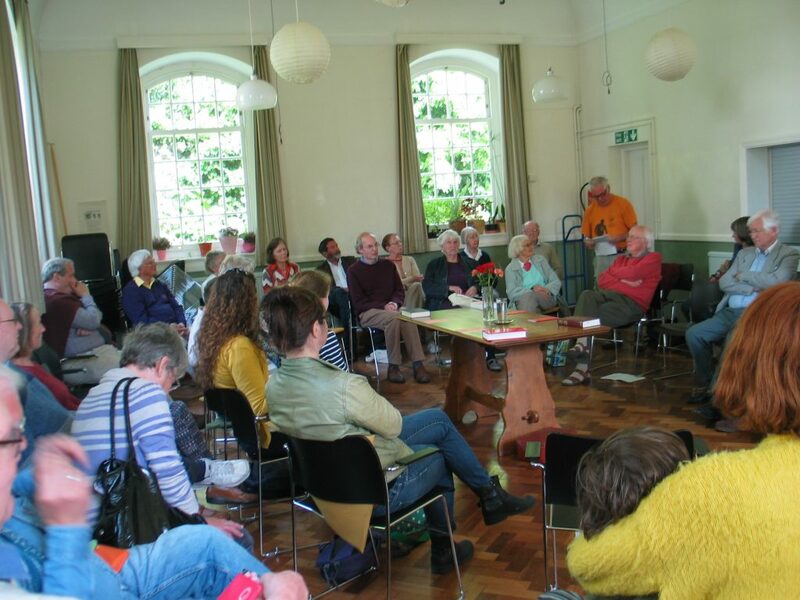 Meeting for Worship is one of the key specifically-religious activities in the Quaker week. It mostly takes place on a Sunday morning, more for reasons of convenience, not because Sunday is considered to be a more holy day than any other day of the week. (Indeed, traditional Quaker usage is not to name the days of the week, but to refer to them simply as First Day, Second Day, etc., and reference can still be found to First Day Meetings.) In larger Local Meetings (including Canterbury), a regular mid-week Meeting for Worship may be held, sometimes at lunchtime, although this may be shorter than the hour-long Sunday morning Meeting for Worship. In some smaller Local Meetings, Meeting for Worship may occur only fortnightly, or even monthly. Quaker religious practice is based within silence. It is a form of attentive waiting, typically performed seated. For many Quakers, they are hoping to discern ‘the still, small voice of God’, or ‘the light of Christ’, or intimations from the holy spirit. For some Quakers, the period of worship is a time for prayer, or for reflection, or for meditation. For others, it is an opportunity to find a place of peace within themselves, and to allow the silence to smooth out the folds, creases, wrinkles and abrasions in their life. Some Quakers spend a little time reading silently from the Bible, or from Quaker Faith and Practice, or from some other book. Sometimes a Friend may rise to their feet and speak. This is called ‘giving ministry’. They speak because they feel moved to speak, and some might suggest that something in them demanded that they spoke, whether they wished to or not. What they speak about is likely to have a strong connection with the thoughts and feelings moving around their mind prior to standing, and may come from a very deep place within themselves. Sometimes what is said surprises even themselves. The ministry is not pre-prepared, is rarely highly eloquent. What is said is always meant with sincerity, is sometimes spoken with passion, although more frequently spoken tentatively. It is unlikely that the person giving ministry will speak for long. It is often the case that, some initial ministry having been given, further ministry on the same theme is offered by other Friends. For example, concern might be expressed regarding financial and social inequality in British society, or about the way that refugees are treated, or about increasing militarism. It is not a requirement that a theme should develop, but when it happens, there occurs a kind of communal ‘deepening’. The Meeting for Worship feels ‘gathered’. Seemingly involuntarily, everyone in the Meeting for Worship is focused on the same theme, although there may be as many different views, thoughts, feelings and beliefs about the theme as there are Friends present. In these circumstances, the ministry that follows tends to provide additional perspectives on the theme. However, there is no discussion, and there are no arguments and counter-arguments, simply different perspectives, sometimes profoundly and radically different perspectives. It is not unusual to feel emotionally wrung-out at the end of such a Meeting for Worship. On other occasions, there is little coherence to the different pieces of ministry given, different Friends addressing different themes. On yet other occasions, especially in small Local Meetings, the Meeting for Worship might remain entirely silent. Some people, including some Friends, can feel uneasy experiencing an hour of silence, whereas for others it is an hour of peace that can help to calm the otherwise perpetual monologue in one’s head. Yet the silence can be of very different qualities. There is all the difference in the world between the silence of things that are not being said, and the silence that falls when all has been said; between the silence of someone in emotional pain, and the silence of someone who feels at one with the world; between the stiff and uncomfortable silence that separates strangers who are wary of each other, and the silence between people who are very much at home in each other’s company. When a Meeting for Worship is silent, sounds from the world outside the Meeting Room become more obvious: birdsong, road traffic, rowers on the river, a thunderstorm. With one’s eyes closed, it can be hard to imagine that one is sitting in a room with six, sixteen, or forty six other people, and a shock to open one’s eyes are to see everyone sitting attentively, ‘waiting in the Light’. An entirely silent Meeting for Worship can feel as ‘gathered’ as one in which there has been vocal ministry. Meeting for Worship typically lasts about an hour, although mid-week Meetings for Worship are often shorter. If ministry has been given shortly before the end of the hour, it is usual for the Meeting for Worship to be extended by a few minutes in order to respect the ministry and allow it the weight it deserves. The end of a Meeting for Worship is signalled by one of the Elders (usually) of the Meeting shaking hands with the Friend sitting next to them. This is followed by everyone shaking hands with the Friends in their immediate vicinity. In smaller Local Meetings it is common for everyone to shake hands with each other, or even to hold hands in a ring. In some Local Meetings the hand shaking is followed immediately by a period of time called “Last Words.” This is used as an opportunity for Friends to make observations, sometimes at some length, mostly about the ministry, in a slightly less formal atmosphere. Sometimes a discussion between two Friends arises. Instead of Last Words, Canterbury Friends are invited to share with the Meeting any personal joys or sorrows currently on their mind. Otherwise, hands having been shaken, the Clerk to the Local Meeting stands and gives notices. These are often announcements, and rarely involve discussion. A principal announcement is about the charitable organisation or worthy cause for which a voluntary collection of cash is being made that month. It is often the case, especially in larger or more established Local Meetings, that tea and coffee will be served once the notices have been given. Some Quaker Meetings have Children’s Meetings. Whilst some children and young people value the opportunity to sit quietly for an hour, there are many who prefer to be active and busy. A Children’s Meeting puts structure into that time of activity. When Quakers marry, the event is termed a ‘Meeting for Worship for the Solemnisation of Marriage’. A Quaker funeral is held in the form of a Meeting for Worship. Occasionally, a specially-arranged Meeting for Worship may be held in some other location, perhaps because a member of the Meeting is housebound, perhaps because the Meeting has taken itself ‘on retreat’ somewhere, perhaps because it forms part of a spiritually-motivated witness to some event or circumstance, such as at a peace camp beside a military base, or as an indication of compassion for and solidarity with disenfranchised or downtrodden people. There are also Meetings for Business, which are considered to be an extension of Meeting for Worship and are held in a similar vein. Like followers of many other faiths, Quakers gives attention to learning and study. Accordingly, there are occasional Meetings for Learning, Study Groups, and also Bible Study groups.